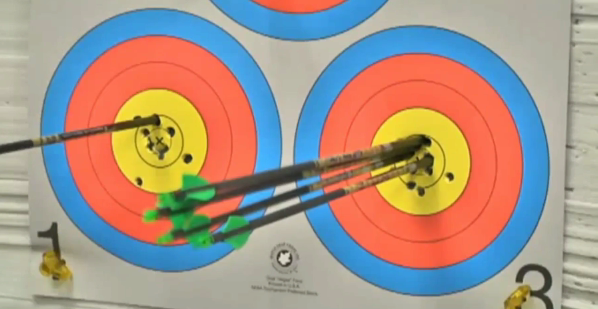 Jeff Fabry is one of the world’s best archers. He’s a five-time Special Games world champion, a three-time Paralympic medalist and he’s aiming for gold at the 2012 Olympics in London this summer. What makes his talent unique is that Fabry, who has only one arm, has mastered the art of firing arrows with his teeth. Your dentist might advise against it, but Fabry, who will compete on the U.S. Paralympics Team in London, says his chompers are holding up just fine. “I’ve been doing this for 13 years and my teeth still look and feel the same the first day I started. Everything is going good, luckily,” Fabry said. But the road to firing arrows with precision was not a straight one. At 15, Fabry lost his arm and a leg in a motorcycle accident. 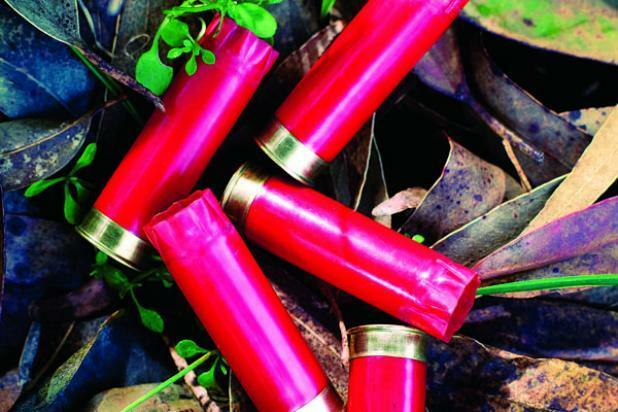 “My buddies were out hitting the hills hunting and I was stuck at home and I was like, no, I don’t like this, so I figured out a way to shoot and it happened to be with my teeth,” he said. 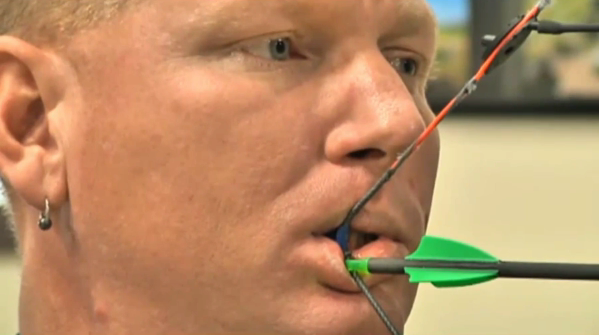 Fabry pulls the arrow back by biting on a mouthpiece that he made from a nylon dog leash. 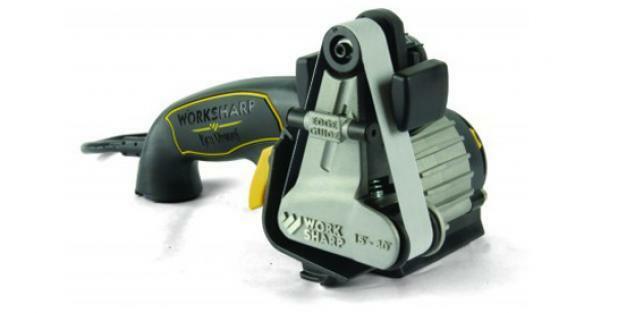 “It was trial and error to find what I considered to be the perfect mouthpiece, where I could be proficient,” he said. Fabry is sharing his passion with our armed forces. He teaches the sport he loves to members of the Wounded Warriors Project, the nonprofit whose mission is to help injured service members cope in civilian society. “What I’m really proud of is being able to work with our vets who are coming back from the sandbox with different disabilities,” he said. Jim Castaneda, a member of the Wounded Warriors, said he is thankful that Fabry introduced him to the sport. 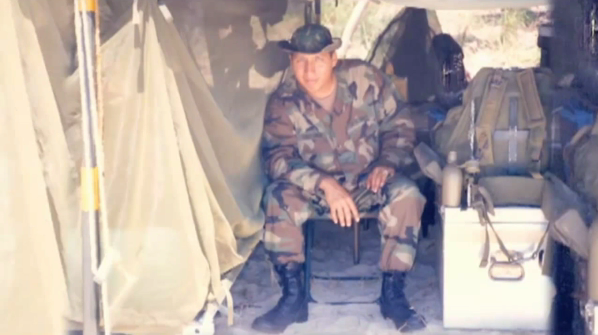 While serving in the Navy and stationed in the Philippines, Castaneda suffered a traumatic brain injury and a stroke. “It’s changed my life completely … I found something that I can do and I really enjoy it and love something now,” Castaneda said. That kind of feedback is a bull’s-eye for Fabry. Will Wilson, who works for Navy Safe Harbor, the Navy’s Wounded Warrior Program, says Fabry is a coach and mentor for his team. “Jeff is absolutely fantastic. He has a great demeanor and is able to communicate clear and concise direction,” Wilson said. Now this might not be good for your stand directly (blender and all LOL!) But it would be great to have on location for spike camps etc. Great idea! 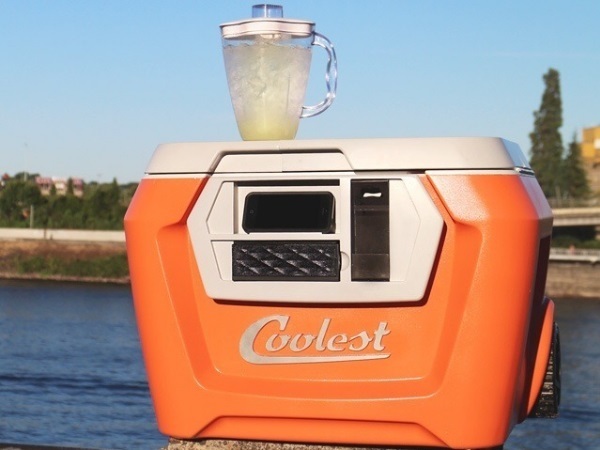 If you had a little too much green beer over the weekend, don’t worry — you weren’t alone. St. Patrick’s Day may have a rich historical point of origin in Ireland, but here in North America, it’s often just an excuse to chug cheap brews died into verdant colors. So here’s a little shamrock for the outdoor lover who might still overindulge. The little green plant known as wood sorrel (Oxalis stricta) has often been mistaken as clover because of its three leaflets. On closer examination, you’ll find a big difference. 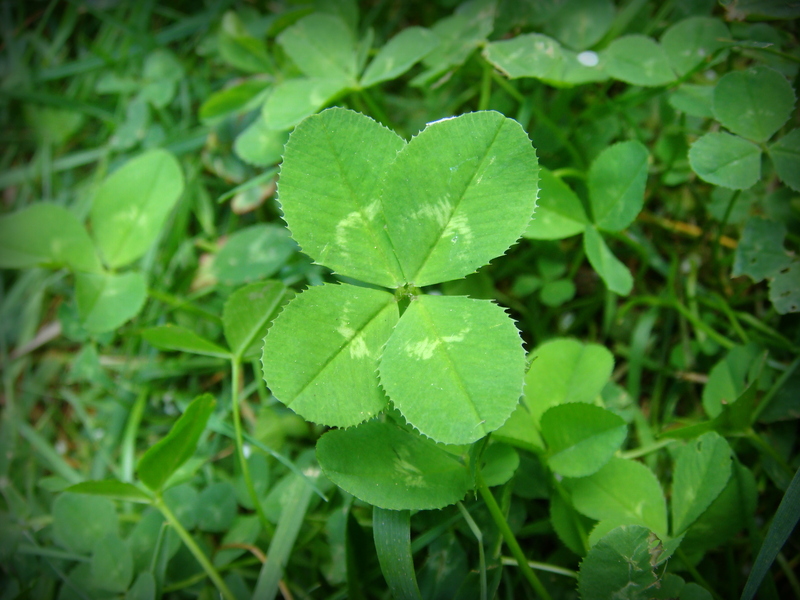 Sorrel’s leaflets are heart shaped, while clover leaflets are round or oval. Wood sorrel grows in both sunny places and shady spots on the edges of woods throughout North America and it has many relatives growing coast to coast. Wood sorrel usually tops out at under a foot tall, and it typically has small yellow flowers, though some species have more pinkish or purplish blooms. Looking much like a classic shamrock, the fresh leaves can be eaten raw as a tasty sour salad green. 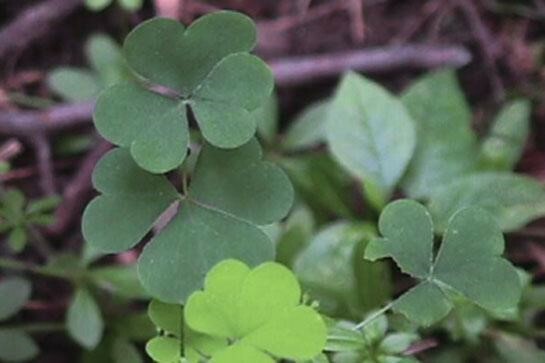 You can also make a helpful hangover cure with wood sorrel. A handful of the leaves can be steeped in hot water for 10 minutes and then chilled to make a cold drink. This cold beverage looks and tastes like a green lemonade, and has the remarkable ability to calm nausea and soothe upset stomachs, which often go hand-in-hand with the headaches of hangovers. While there’s no problem with the occasional consumption of this plant, use it in moderation over the long term. The sour tasting oxalic acid in wood sorrel can inhibit the body’s absorption of calcium and possibly contribute to kidney stones over time. Look for related edible species such as the violet wood sorrel (Oxalis violacea), the pink wood sorrel (Oxalis montana), and other members of the Oxalis genus. Have you eaten this wild edible? Or used it to treat nausea? Leave us your comments. 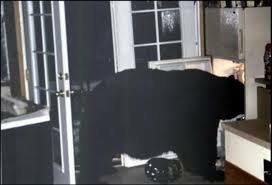 Sara Edwards of Ketchum, Idaho, slept through a bear invading her kitchen.Wow, talk about a heavy sleeper. I think most people wouldn’t be able to sleep through a bear invading their kitchen. Add in a barking dog and the fact that the woman in this story was asleep on the couch right next to the kitchen, and her slumber seems even more remarkable. But, according to her husband David Edwards, it was a good thing his wife slept through the bear invasion. According to the Edwards, a black bear broke into their home in Ketchum, Idaho, entered the kitchen and proceeded to lick the leftover Chinese food from a cast iron pan on the stove. Edwards told the Idaho Mountain Express that he was awakened at 3 a.m. by his barking dog. Edwards walked past his wife, Sara, who was asleep on the couch, and his aggressively barking Irish setter-Lab mix, Stanley, to discover a black bear on its hind legs with its paws on the stove. The bear then stood up and looked at Edwards. So instead, he simply woke her up and led her to the bedroom without mentioning the bear. Then he crept back into the kitchen to discover the bear had left through the wide-open kitchen door. I wonder how his wife reacted when she found out she’d slept through a bear break-in. 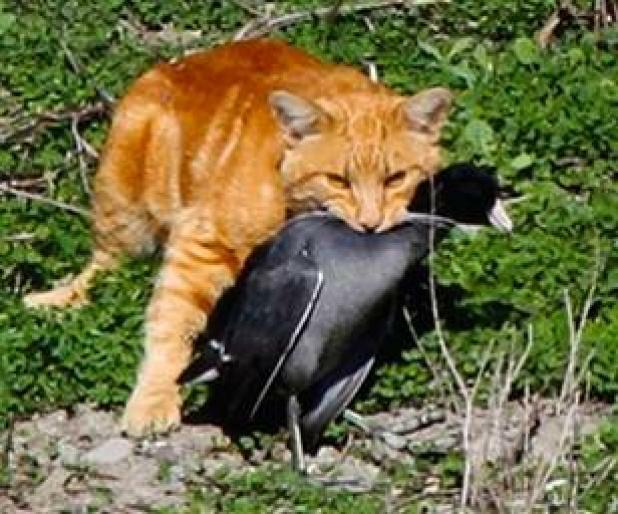 Cats that live in the wild or indoor pets allowed to roam outdoors kill from 1.4 billion to as many as 3.7 billion birds in the continental U.S. each year, says a new study that escalates a decades-old debate over the feline threat to native animals. The estimates are much higher than the hundreds of millions of annual bird deaths previously attributed to cats. The study also says that from 6.9 billion to as many as 20.7 billion mammals — mainly mice, shrews, rabbits and voles — are killed by cats annually in the contiguous 48 states. 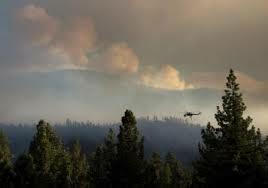 The report is scheduled to be published Tuesday in Nature Communications. “I was stunned,” said ornithologist Peter Marra of the Smithsonian’s Conservation Biology Institute. He and Smithsonian colleague Scott Loss, and U.S. Fish and Wildlife Service biologist Tom Will conducted the study. Yes, that’s right. Billions. According to the story, the study reveals that free-ranging cats are likely the single greatest source of mortality for birds and mammals in the United States. The study is also critical of one of the more ridiculous schemes to deal with feral cats; the so-called “TNR” programs (for Trap-Nueter-Release) that feral cat advocacy groups love, calling them “potentially harmful to wildlife populations” because such programs simply return feral cats to the wild to continue killing wildlife. The study also tried to put a number to just how many un-owned cats there are in the U.S., with the estimate being anywhere from 30 to upwards of 80 million cats. Of course, cat lovers have been pushing back against the study, saying the felines are just convenient scapegoats for habitat loss, window and vehicle collisions, and other man-made hazards. I’d argue that feral cats ARE a man-made hazard, one that something should be done about.